Netizens think that hackers are using a special platform in a dark place in order to steal the money from the banks. The real thing is that they use the same PC but hiding their IP address using some software. Black hat hackers are using psychology based attack on email users. They get your username and password from you through Phishing emails. Phishing emails are the most dangerous threat to the growing online businesses. It's a major threat to online services which requires a premium subscription from consumers for getting access to their services. Cyber-criminals are imposing a phishing attack by sending bulk emails to scam you. They disguise themselves as an authoritative person or company. They can even send professional and intelligent phishing emails to look legit and trustworthy. Those emails will look like it came from the services which you're subscribed. It is otherwise called as Spear Phishing. So, when you receive a professional phishing email, you may not find the difference between the legit and scam email. If you fall for it, they will easily get your sensitive information and your money. Businesses contact their consumers through email regarding their subscription, features, notifications, and updates. Hackers mask themselves as businesses to scam netizens by sending fraudulent emails. If you're receiving scam emails, you can report scammers to Google for a review. 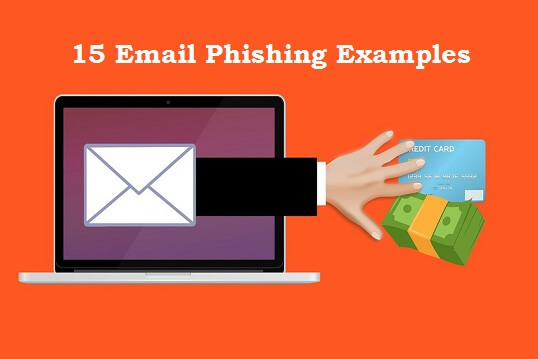 In this article, you'll see many Phishing emails examples. Learn to identify and avoid phishing emails. 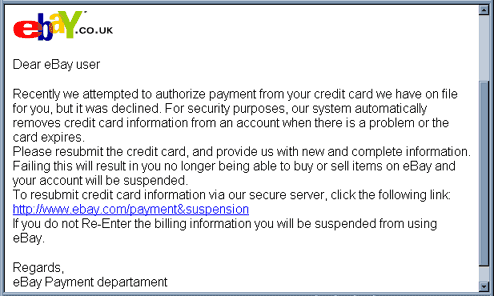 It's a phishing email from hackers telling to activate the Amazon account which was deactivated due to some reasons. The fun part of this email is that they also give 14 days to reinstate the account. You can see a link which will be pointing to the website set up by hackers to get your password and other information. PayPal phishing is the most popular method hackers use to steal your money. 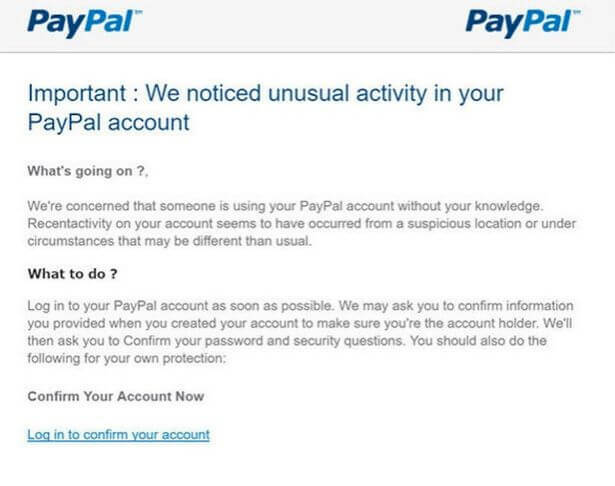 If you're a PayPal user, you should be very careful about scam emails. Never use the PayPal email anywhere for communication or subscription. Use your PayPal email only for making and receiving payments. The above example is a tricky email to get your logins through the phishing link. It's an eBay phishing email to get your credit card details. The link showing that it comes from eBay but it is not. It has no https in URL and it could be a masked link. Netflix, the premium membership site for streaming films and TV shows. The above phishing email example is the direct call to get your payment information. Spotify is an online audio streaming platform which delivers subscription services. 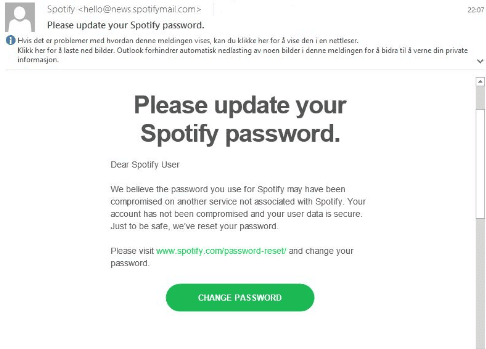 This email example shows that it's a phishing trick to steal your password. Here's the Apple phishing email example which can trigger the user to believe the message. 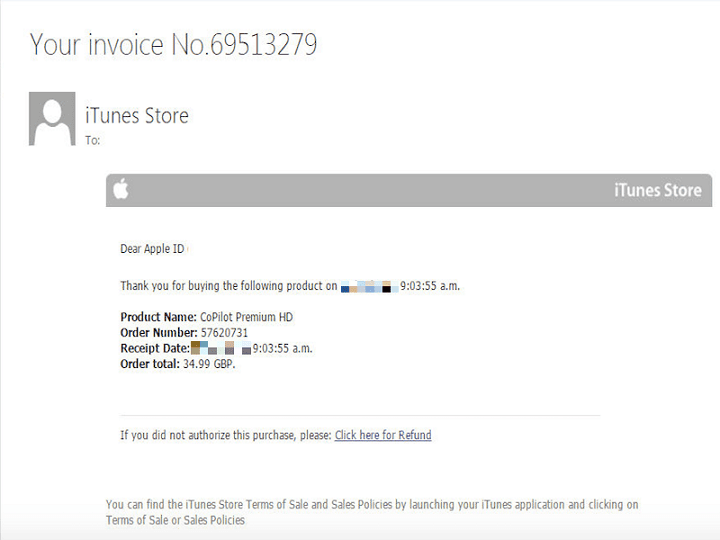 If you're an Apple user, you should be careful about this kind of scam emails. 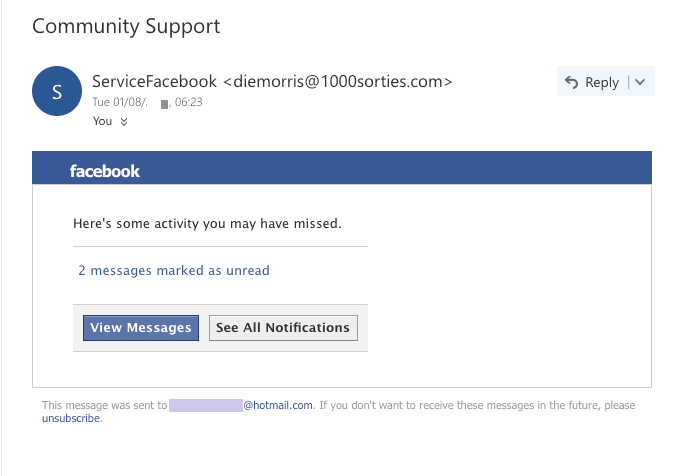 It's a simple phishing message look like it was sent by Facebook. 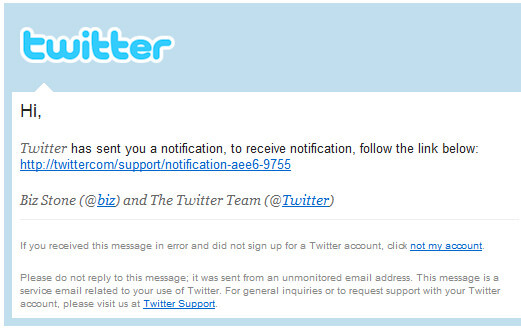 It's a straight forward Twitter phishing email asking you to follow the link to hack your account. Are you a cloud storage user? 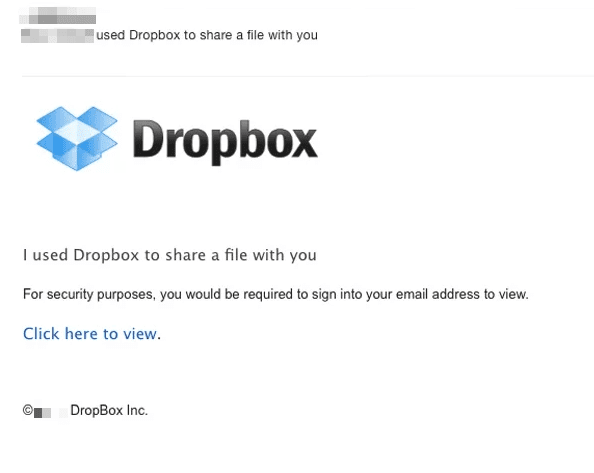 Do you use Dropbox to store your data online? Beware of the friendly email from an unknown person. Do not attempt to download the file in the link. It might be a malware file to infect your computer. 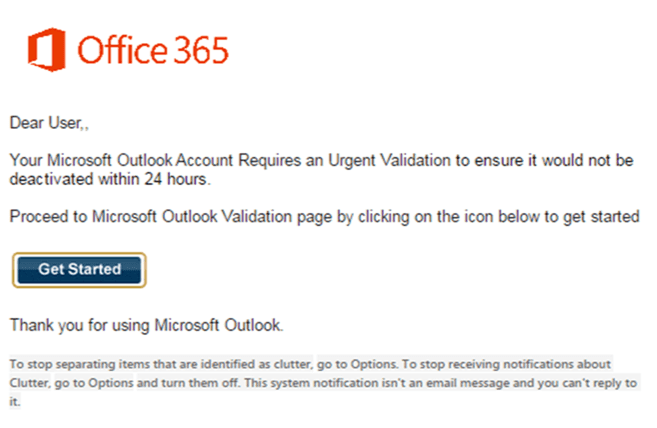 It's a phishing call asking to urgently verify the Office365 account. It's a phishing email asking you to verify your bank account information. It's a masked URL which is not linked with the concerned bank. It is one of the examples of Spear Phishing. 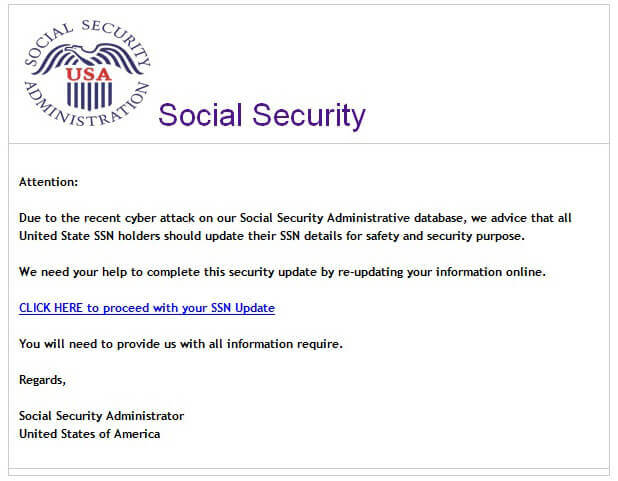 It's an intelligent phishing email asking you to update your Social Security Number (SSN). The email has a fake awareness message which can innate you to click the link. It's another example of Spear phishing. 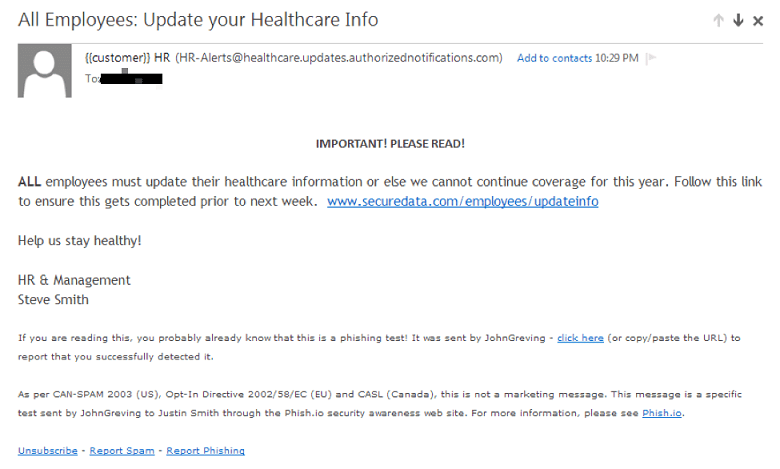 It's a Human Resources phishing email example showing how scammers alert the users to update the healthcare information. By sending this type of scam emails, hackers can get your health information. 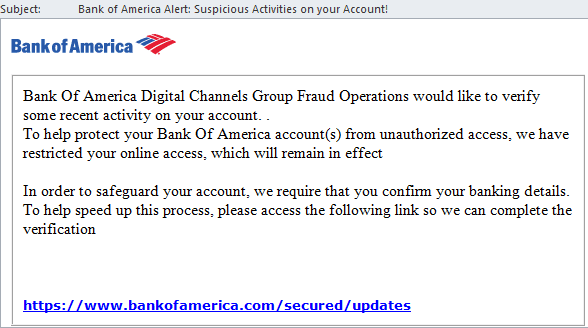 Here is another bank phishing email to confuse the user. The aim of this email is to get your net bank logins along with security information. 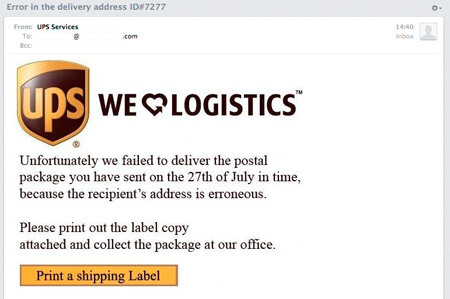 It's a false email that looks it is from United Parcel Service. Clicking on the given link button can infect your computer system with a trojan virus. After clicking a fake link, you'll enter a phishing website. Hackers set up a phishing site which looks exactly like the legit website. 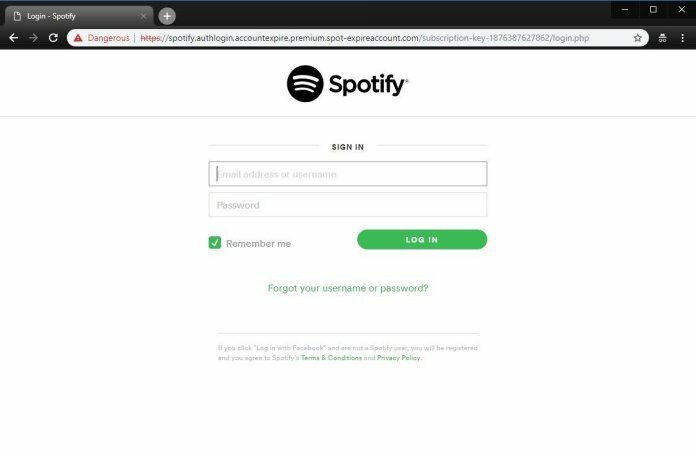 The above example is a Spotify phishing website. Look at the suspicious link in the URL address bar to know how long it is. Besides, you can notice that the site lacks SSL certificate which means it is not secured. Did you know that all the membership sites consistently change their website layout design? It is to help you to find the difference between the original and phishing website. You Can't Stop Phishing Emails But You Can Avoid! When you receive any kind of suspicious email, check the authenticity of the sender, subject and the content. If you react to those scam emails, you'll lose your information. Directly enter the full legit URL in the address bar. Else, do a search online to find the original URL. Then you'll come to know whether the email you received is a legit or scam message. You cannot stop the spammers from sending you spam emails but you can surely avoid and ignore them. Previously, we've discussed how to identify and report phishing emails. I recommend you to check out this guide. I hope this helps. Share this post to create awareness!